In other words, although ST_Xstring is declared to be a restriction of xsd:string it is, via a proprietary escape notation, in fact expanding the semantics of xsd:string to create a value space that includes additional characters, including characters that are invalid in XML. […] The reader might think that I exaggerate the importance of this, that surely ST_Xstring is only used in OOXML in edge cases, in rare, compatibility modes. We wish that this were true. However, a look at the DIS 29500 shows that ST_Xstring is pervasive, and in fact is the predominant data type in SpreadsheetML, used to express the vast majority of spreadsheet content, including cell contents, headers, footers, displays strings, error strings, tooltip help, range names, etc. Any application that operates on an OOXML spreadsheet will need to deal with this mess." 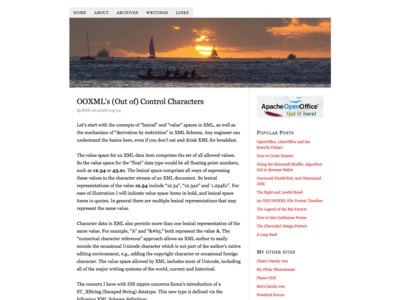 A commenter says: "I thought OOXML stood for "optionally open XML" but it looks to me it actually is a recursive acronym: OOXML Obviously ain't XML"